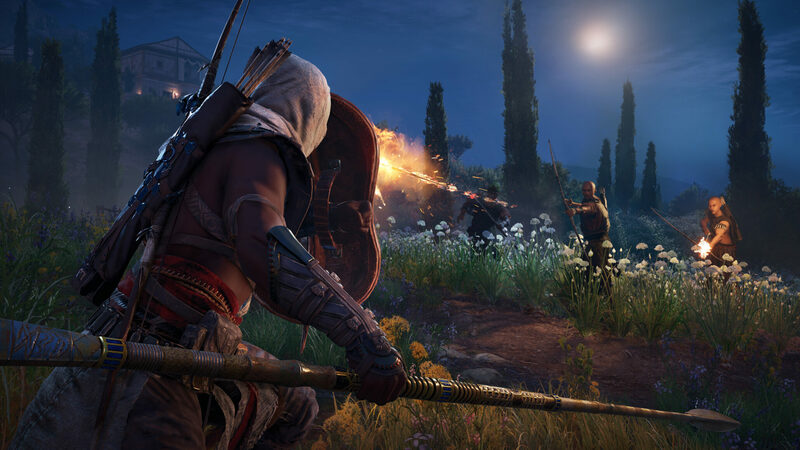 Assassin’s Creed Origins, the long anticipated new entry in the series releasing later this year on PC and consoles, is still far from release and there’s still a lot we have to learn about the game. In the past few days, game director Ashraf Ismail revealed some interesting new details that will make fans of the series happy. Asked about the horse archers seen roaming around in the gameplay footage released a little while back, Ismail confirmed that these characters are moving dynamically through the world and their behavior and agendas will change based on what happens to them on the road, something that should make the Assassin’s Creed Origins world feel alive more than ever before. The Assassin’s Creed Origins director has also been asked about Senu, the faithful companion of the Assassin Bayek, and he confirmed that Senu will be able to fly as far away from Bayek as players want, so there won’t be any sort of restriction. Finally, Assassin’s Creed Origins’ arrows will be real projectiles and will come with real physics. Assassin’s Creed Origins has been officially announced during the E3 2017 last month, and plenty of gameplay footage emerged online since then. Last week, a 4K gameplay video has been made available, showing how the game will look like on the upcoming Xbox One X.
Assassin’s Creed Origins launches on October 27th in all regions on PC, PlayStation 4 and Xbox One.